Hi everyone, today I have another Christmas in July themed card for you all for Craftie Cafe. Today I’m using a couple of WPlus9 stamp sets along with Distress Oxide inks and Lawn Fawn inks also. To begin my card today I stamped out my images. 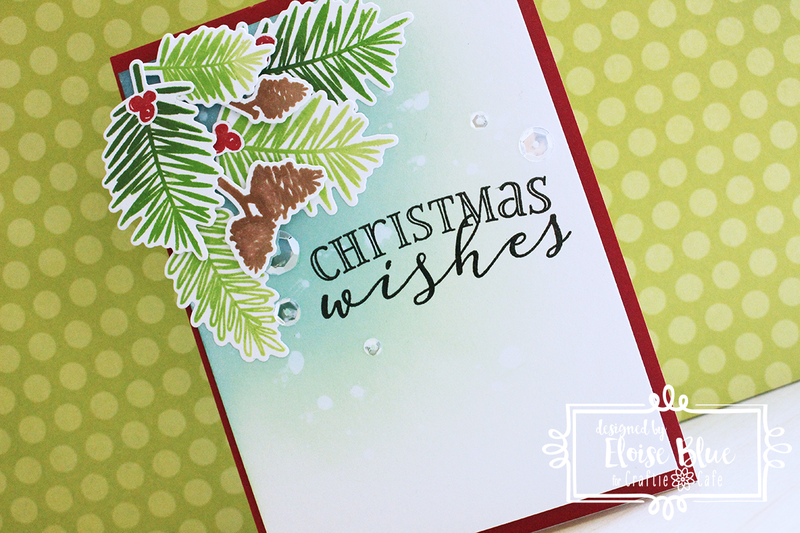 I pulled the Holiday Boughs stamp set out with some white cardstock and placed one of the leaves image in my Stamp Master Tool. I first rubbed it down with an eraser to remove any residue off of there, so I could get a perfect impression and then I inked it up with Celery Stick ink and stamped it down. I then went in with Jalapeno ink and inked up half of the image and dabbed away on the top of my image some of the ink with a cloth and stamped down again. This created a fun two tone stamping effect and just adds more to your solid non-layering images. I repeated this same step with all my different images. Once they were all stamped I used the coordinating dies to cut them all out. Now, I needed to colour my background. I pulled three colours of Distress Oxide Inks and blended onto some watercolour cardstock. I first started off with Cracked Pistachio and went in a diagonal line from the top left hand corner to the bottom right hand corner, blending super softly and light to create a seamless look when I wanted it to fade out into white. I then used Broken China and Faded Jeans also to give it a gradient look. Next up I placed my now blended piece back into my StampMaster Tool and adhered it down with some washi tape so it would be flat. 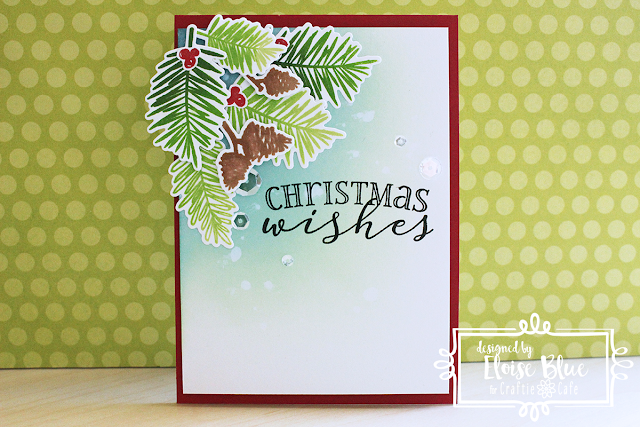 I pulled the Be Merry stamp set also out and used the Christmas Wishes stamp in the set for my sentiment. I placed down my sentiment onto my blended panel and then took all my leaves and pinecones images and placed them down in a cluster in the top left hand corner, so I could get my placing right. Once I placed them down where I wanted them I picked up my sentiment with the door of the tool and stamped it down using black ink. I then used some Press N Seal to pick up all my images that I placed in a cluster and adhered them down in layers using different adhesives. To finish up my card completely I stamped down my red berries and cut them out to stick them onto my leaves too, to give it a little more colour. I then adhered down some Sparkling Clear Sequins from Pretty Pink Posh around my sentiment also. I pulled some red cardstock from my stash and adhered it to a card base and then foam mounted my panel on top and that finished up my card.